Croatia | Where is Yvette? 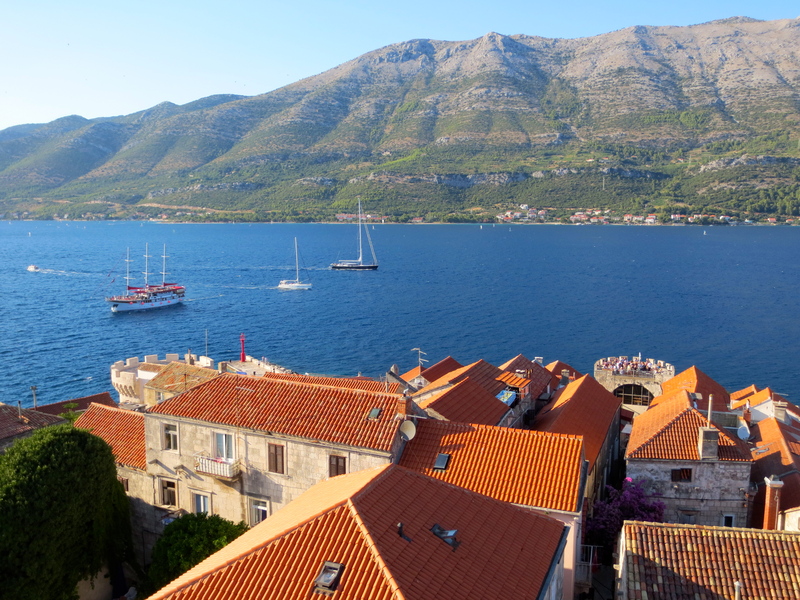 Korcula is one of those magical places in the world you never hear of because it keeps getting usurped by its big brother right next door, Dubrovnik. 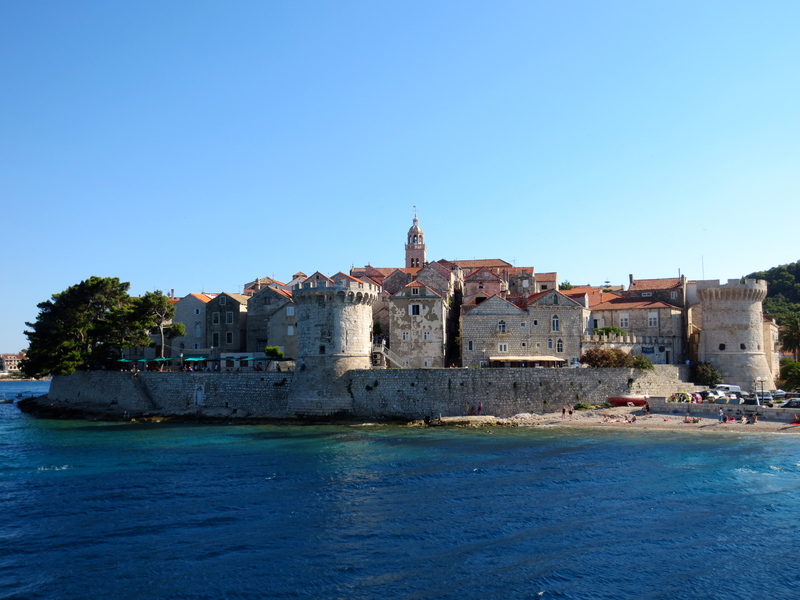 Both are walled cities built in Venitian style on a point beside the sea, but Korcula is just so much smaller and harder to get to since it’s on an island that far fewer people visit it. 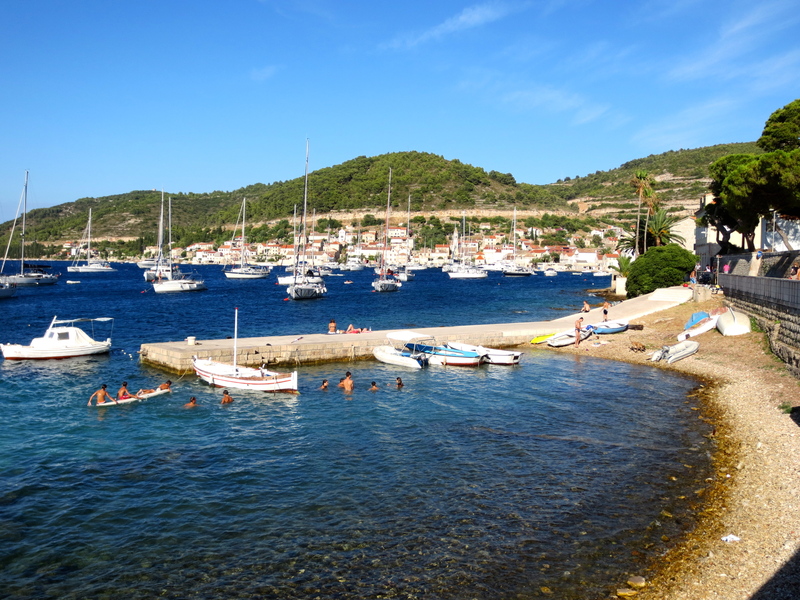 Korcula is certainly worth a day though. An outpost of the Venitian Republic, there are Venitian lions all over town and even a (much smaller) St. Mark’s church. The locals even claim Marco Polo- the most famous Venitian traveler of them all- was born in the city walls, and will happily take your money should you wish to visit his alleged house. No real proof of this, of course, but why let that get in the way of having a famous hometown hero? Yeah, this will end well, I can tell! Anyway, I rather liked Korcula and it is definite proof to me that if sailing in Croatia one should definitely head southward from Split instead of northward from Dubrovnik. Because it really is a nice little town, but I think I would’ve been underwhelmed had I visited its big brother first! 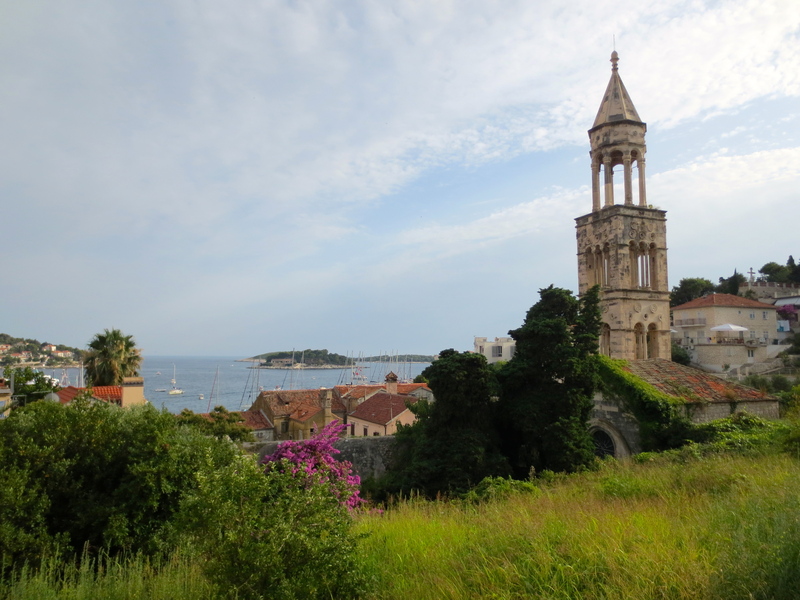 I first visited Hvar four years ago (that is, the town named Hvar on the island of Hvar), and it was one of those places where I was nervous to return to because I was afraid it wouldn’t be as great as I remembered. You see, four years ago I came in April when one quickly realized it was out of season because it was raining buckets and I snagged a studio apartment for US$27 a night from a little old lady holding one of several dozen “soba rooms zimmer” signs at the bus station. Despite this I absolutely loved the town- one of the few places I wished I wasn’t solo on that trip as I wanted to share it with someone- and knew I wanted to come back in its height to see what it was like. There is something magical about slipping off a boat at night and into the harbor of a little island town in the Mediterranean. After a hot day under the oppressive sun the air is cool- people are out and about who spent the day on the beach or in their houses, and life spills out onto the streets. Cafes are filled with people eating and drinking, children are selling lemonade and seashells to passerby at an hour where in most countries they’d be in bed, boats are bobbing softly on starlit water. Perhaps it’s the astronomer in me speaking (or a woman who knows her Shakespeare), but there is really something special about a town that is in love with night and pays no worship to the garish sun. Split is the sort of place that’s fascinating to visit as there are few places on the planet where the unintended consequences of your actions are so heavily on display. It was first built as the retirement palace for the Roman emperor Diocletian in the 4th century A.D.- the emperor who split things up into an eastern and western empire, another action that has reverberated through the centuries- but in the centuries since the locals have converted the remains of the palace into a city. The result is a unique rabbit’s warren of narrow alleys and jumbles of houses and shops, which you wander aimlessly and keep running into random things like an artist’s gallery or a dentist. It is magnificent. 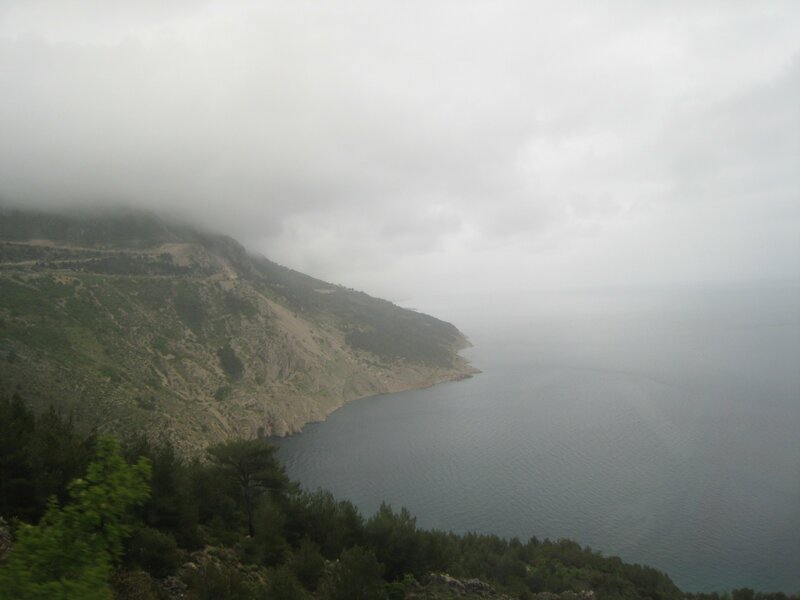 If one photo isn’t enough by the way, here is the post from when I first visited Split four years ago. 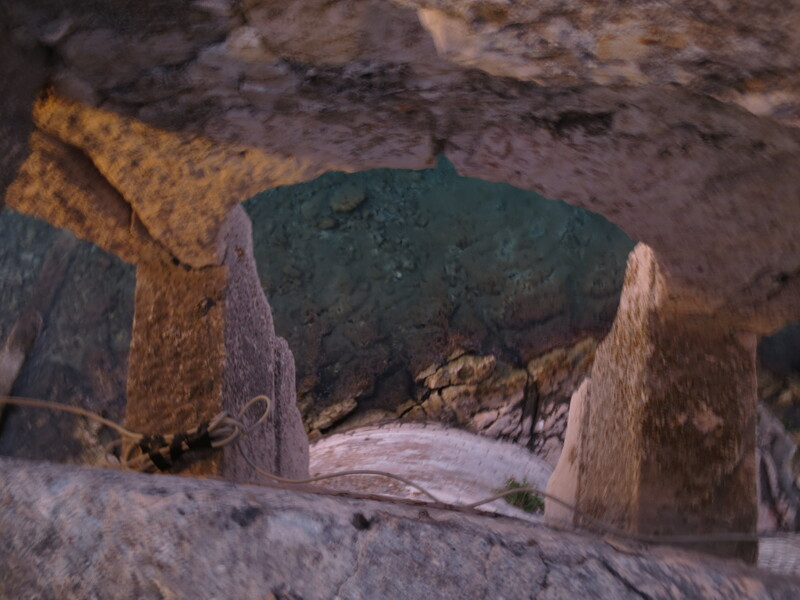 As you can imagine, it’s the sort of place you’re very happy to explore all over again! There are some places in the world that are so very awesome that years after the fact you have no choice but return to them. 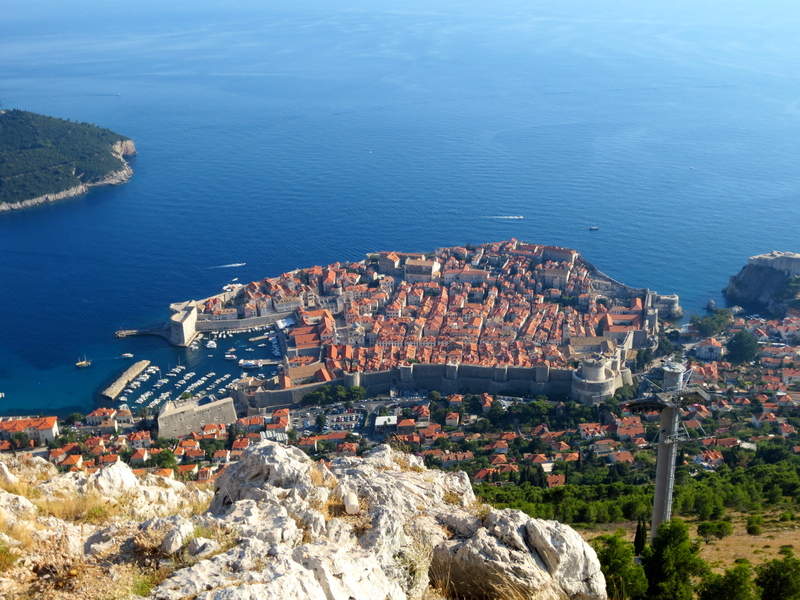 For me, the Dalmatian coast of Croatia is one of these places: I first came here four years ago as part of my six month jaunt around the world, but it was in April and being the off season it rained a lot, very few of the ferry services were running so it was hard to get around to the islands, and there were so few other travelers in the Balkans that it got a little lonely. 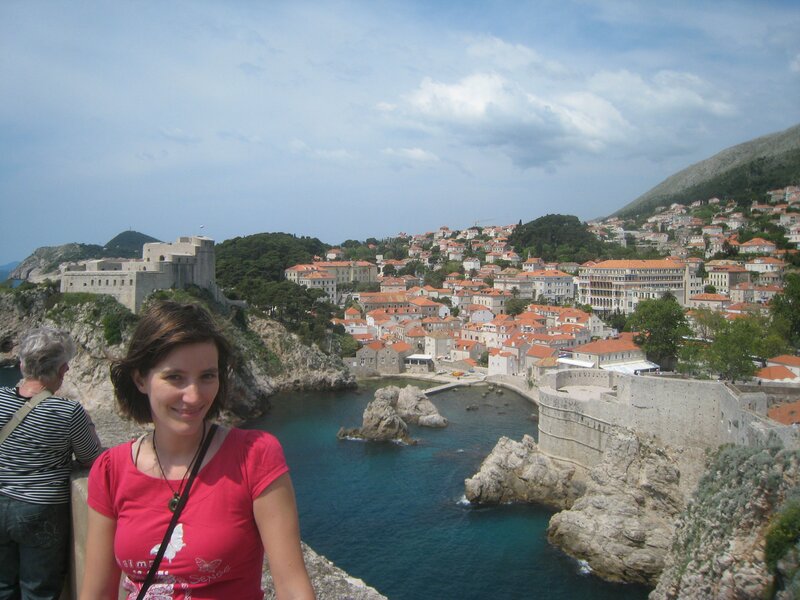 So I left with the understanding that I would someday return in order to do one of the Split to Dubrovnik boat trips popular with the younger crowd in the country, both to revisit the places I loved and to see some new ones along the way. 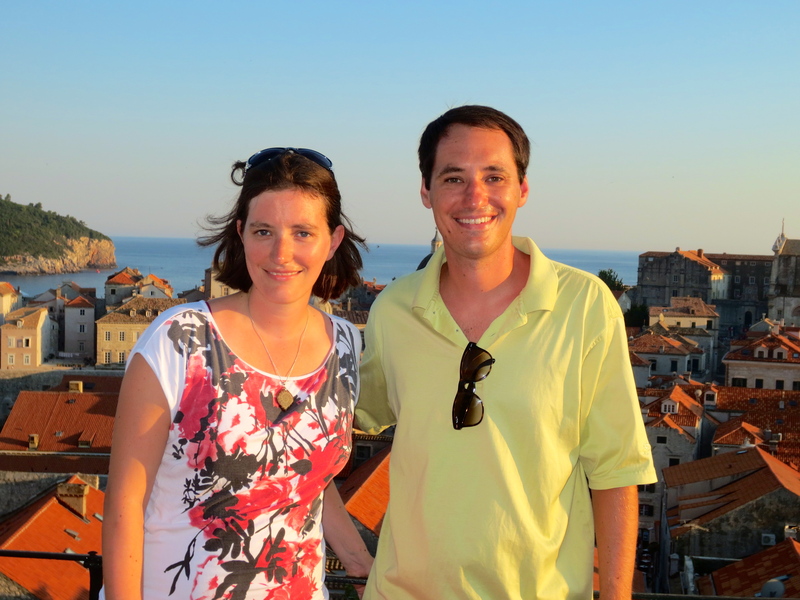 And since my brother Patrick is moving back to the USA this fall after two years of steadily meeting up often to work on our “things to do in Europe” checklists, checking off the last big one of cruising Croatia together seemed like the way to go! Everyone always asks how Patrick and I travel so well once they learn we’re twins. Our response is always we shared a womb for nine months, so shouldn’t it be easy after that? Now to get this straight, I am not normally a cruise-type person: I went on one once with my parents and was forever frustrated by all the group organization and the fact that you’d be in an amazing place for only a few hours you’d normally spend a week exploring. But it turns out the main reasons I didn’t like that earlier cruise don’t really apply in Croatia: the distances are so short that one is likely not doing more than a few hours of boating a day (complete with a lovely swim stop- Patrick and I bought a cheap snorkel mask, which was the best investment ever! ), and each location is small enough that after an afternoon and evening of looking around we felt that we’d seen most of what it had to offer since they were primarily small places. Add in the unreal blue of the Adriatic and the fresh seafood and stunning coastline and, well, it was a truly lovely week! So now that I’m back home, be prepared for a flurry of short Croatia posts as I’ve realized those are much more likely to get done than a mammoth “My Week In Croatia” one. 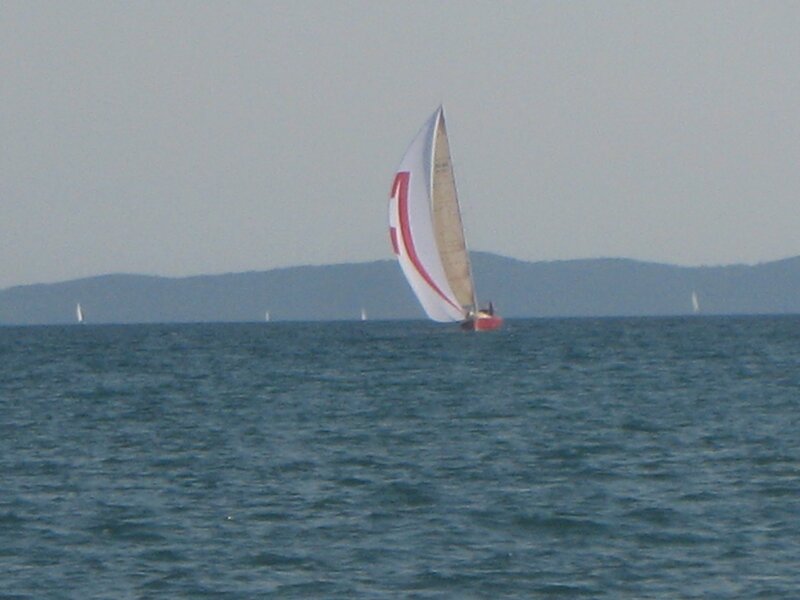 Plus hey, it turns out I’m a sucker for taking pictures of cool boats and the coastline, and what else am I going to do with them? 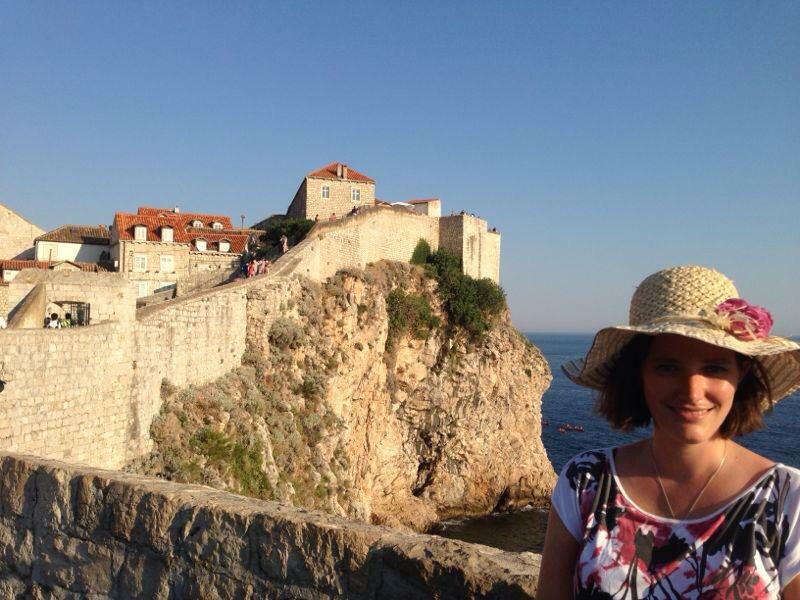 – I loved living in the ancient Roman ruins at Split. The Split Hostel is a neat place too (motto: “Snooze and Booze”) with probably one of the best locations and nicest staff I’ve come across. – That having been said, I don’t think you should go to Split without devoting some time to the islands in the area. 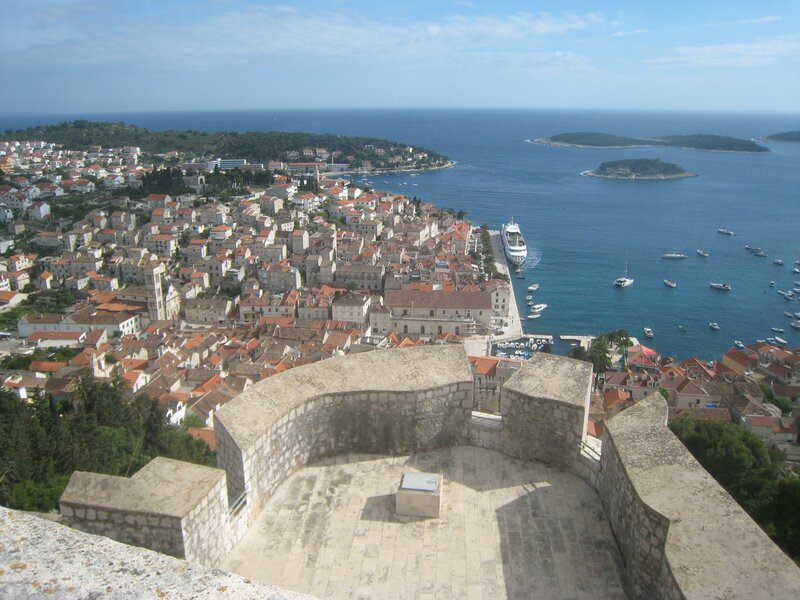 Notably Hvar. 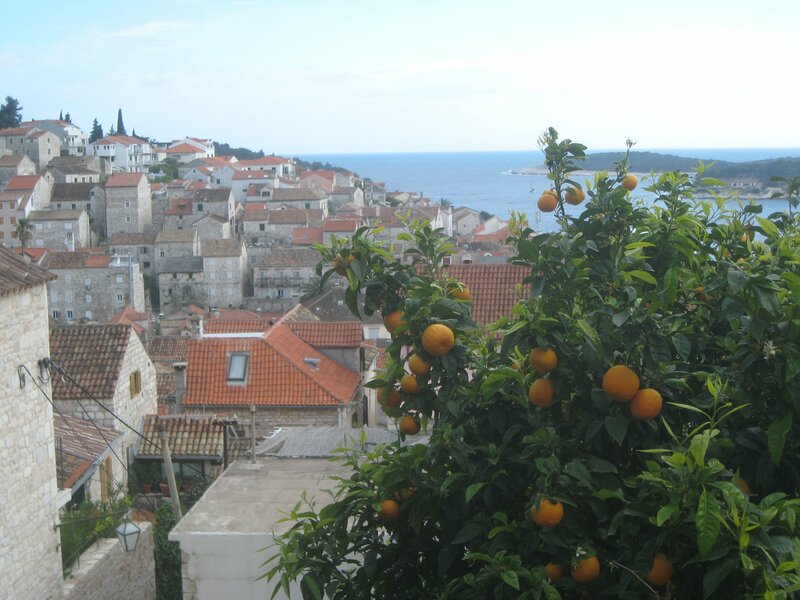 Hvar is one of those places I was actively scheming to return to while still there, and I loved my apartment. – Oh, and I gotta mention that I finished the 1,000+ page Pillars of the Earth the week I was in Croatia, not to be compared to how I finished its 1,200 page sequel in four days not long after. And this is why I don’t buy many books on this trip, get me close to one and it will be consumed incredibly quickly. – Rain, rain go away… it rained at some point every day while I as in Croatia. Often not long and in a brief afternoon thunderstorm, but it would always be just when you were planning some activity or another. – And this might sound like an odd complaint but… I never got used to the Croatian currency, the kuna. It’s about 6 kuna to the dollar and you often find yourself getting one or two kuna as change, which you forget about and suddenly realize you have several dollars worth of change to get rid of. I didn’t have issues like this in other countries so I don’t know what it was, but I felt like I was always trying to shed currency- not the best mentality to have!